Sytsevich is part of a gang of Russian mobsters defeated by Spider-Man during a foiled hijacking. Humiliated by the hero, he decides to extract revenge by becoming a one-man army. Yes he did, and what a waste it was. Paul Giamatti could have made a very good Rhino, in some other reality, but instead he was squandered. 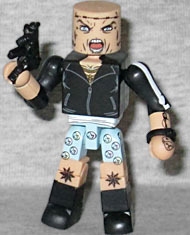 But hey, we've never had an Aleksei Minimate, and this one is as good as it gets! He's wearing his black track suit, and the set even includes extra legs for when Spidey decides to pants him - with tiny rhinos on his boxers! He's got a crazy look on his face (perfect!) and is armed with an MP5. He's painted with many of his tattoos (nicely explained in the video below) but what's really cool is that they've been "Minimatized" - the winged skull is block-shaped, and the hand holding a gun is a round Minimate hand. Superb attention to detail! This is a goofy figure and I unironically love it. A promising young engineer, Alistair works in research and development at OsCorp, alongside his father Spencer Smythe. His work in robotics and A.I. has made him a rising star. In the comics, Alistair Smythe was the scientist who built the Spider-Slayer robots, usually with the financial backing of J. Jonah Jameson. [Actually, it's about ethics in superhero hunting --ed.] 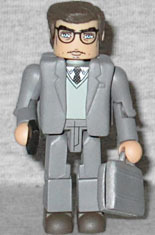 In the movie, Alistair Smythe was a mildly snottier version of Ryan from The Office. Did you ever think you would own a BJ Novak toy? Now you can! He's just a guy in a suit, but like Hank Pym, you can take off his jacket for a more casual look. He has a cellphone, because literally every set in Series 56 did, and there's also a briefcase which could either belong to him or Aleksei - you decide! Introducing... the Sense of Right Alliance! 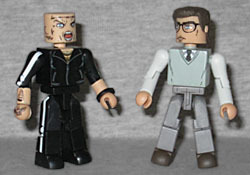 This entry was posted in Art Asylum, Marvel, MMMR, videos and tagged Minimates, Spider-Man. Bookmark the permalink. Wasn't it Spencer Smythe that was financially backed by J.J.J.? I thought Alistair was the member of the Smythe family driven purely by revenge for his dad's death. The joys of a misspent youth. lol.